Just wanted to add my sincere thanks as well. I think the benefits of the course are 2 fold – first equipping us as a couple with the knowledge of what was happening at each stage, and the breathing techniques, which are vital. This created a real sense of comfort for me and Claire that we knew what we were doing. I think the key benefit of the course is the relaxation techniques however. Subconsciously and consciously, I think these played a key role in a peaceful and natural birth for both Claire and Oscar – the midwife commented at how consistent and relaxed Oscars heart rate was during birth and Claire was peaceful and serene between contractions and pushing. All in all highly recommended and would like to say you were wonderful – demeanour, teaching style and balance of approach. We just wanted to let you know that baby Oscar arrived at 6:53 on 27th December weighing 7lb 14 through a natural water birth with no pain relief as we wanted. The Hypnobirthing techniques we learned definitely helped with this and with Andy’s support I was able to remain calm and focused as things progressed. I definitely would not say the experience was painless but I was able to manage through the pain with the breathing and relaxation techniques. At any time where I started to lose focus as the surges escalated, Andy was able to bring me back to focus by breathing with me and doing to relaxation techniques. Thank you so much for your help. I went into the birthing without fear, with positivity and focus and we have a beautiful baby boy. I would definitely recommend Hypnobirthing to anyone having a baby. 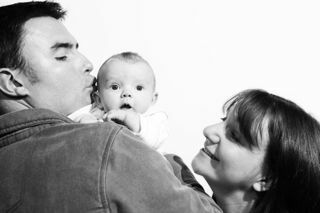 I am so glad we found Sacha and attended her hypnobirthing course prior to the birth of our son. I had been very scared of labour and not sure that anything would be able to help me overcome these anxieties. From the start Sacha was amazing, setting realistic expectations and explaining the principles of hypnobirthing very clearly. My husband and I greatly enjoyed the sessions. We found the course well-paced and relaxing, often falling asleep during relaxation exercises! The course materials were excellent and I found the nightly rainbow relaxation helped me to sleep throughout the later stages of pregnancy. Instead of feeling increasingly scared as my due date arrived, as I had expected, I found myself feeling calm, rested and ready with only a mild dose of trepidation. We used the methods throughout the labour and it enabled me to feel in control and know exactly what to expect every step of the way. It also meant my husband could practically support me as we had practiced the relaxation techniques together beforehand. Sacha’s practice is rooted in her own experience of giving birth using the method and I found her personal reflections brought the theory to life. She is a special person and her hypnobirthing course was invaluable to us. We did the full course with our second child and a refresher session for our third. Without it the births would have been much longer and more painful. It also meant the recovery post partum was quicker. The hypnobirthing practices were also good bonding sessions for my husband and I, as well as bonding towards our baby in our busy lives, which was just as important as the birth itself. Having been recommended the Hypnobirthing course by a family member I have been wowed by the standard and quality of both the course and most importantly, Sacha. My husband and I have been given so many valuable techniques, information and also learnt quite a lot about our relationship in the process. I have utter confidence in the course and in Sacha and know now that our birthing experience will be a relaxing, enriching and enjoyable time and our baby will be healthier and happier as a result. I whole heartily recommend the Hypnobirthing course and Sacha to all mothers.